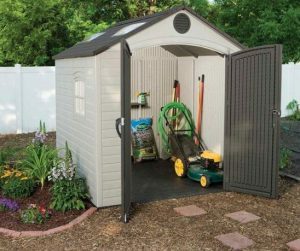 Lifetime’s backyard resin storage sheds virtually eliminate maintenance, superseded by a cleanable surface that’s a jiffy to wash. If your location accommodates 8 feet in width, just work out the desired length, their selection fulfils multiple depths. This well-favoured 8 ft width assortment spans from the smallest 2.5 ft length stepping up in 2 ½ feet increments, rising to the supersized spacious 15 feet storehouse. 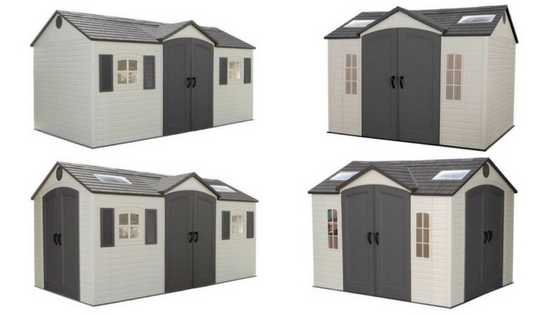 Respective to the desired model, each shed is uniform across their frontage, consisting of identical doors, vents, roof formation and dimensions. 2½ feet extension kits consisting of the floor, facade and roof expand the range, furthermore a truss system is internally introduced within the rafters to bolster reinforcements at the summit. Organising space in our garage by shed-sheltering all the outdoor gear in the yard to where it’s predominantly needed most delivers leisurely convenience for storage access notwithstanding the freedom accomplished for parking the car. The first two years regarding the user-friendly service our traditional facility catered for were superb, then the phase of decline commenced, ignoring all those annual nurturing coats of varnish we gave – there’s gratitude! Decay degenerated around the fixing nails loosening the panels, roofing felt disintegration led to a few replacements over the years then as a consequence of rot decomposing the floor it was time to exchange, with emphasis made to evade the hassles. Like a duck out of water we searched for a suitable successor. Polypropylene and polyethylene makeups floated our boat with regards to practicality, style and dimensional options. We were quite taken aback with the varied cross-section of choice. Fusion’s composite sheds offer conventional charm, Oakland’s gorgeous man-cave looks are paintable, Suncast exhibit the most picturesque of impressions, Grosfillex deliver attraction through their study PVC make-up meanwhile Factor sheds refrain from quality finishes, instead they offer the most reasonable set of prices. Lifetime boasts their makeup smashes the competition, who am I to judge however they have skirted their design around the pitfalls beholden to metal sheds, delivering remarkable results. This video demonstration regards the 8 x 7.5 feet model however all sizes within this range conform to the same make-up & design, it’s well worth viewing. This is the smallest unit spanning a narrow 2½ ft depth, favoured for situating with its back to a wall or slotting into narrow spaces. By designing durable High Density Polyethylene plastic into reinforced twofold panels overcomes denting & warping issues, a drawback the flimsiness of metal sheets are vulnerable to although they are secured to a steel framework which bolsters their strength. Likewise, Lifetime’s design competes with a similar sturdy metal infrastructure to which the panels attach. Furthermore, all the metal structural parts are treated to combat rust. Obviously this type of plastic doesn’t rust, neither does it peel nor deteriorate by means of decay, it’s weather-resistant through & through and never requires painting whereas colour bleaching as a consequence of sun-rays assault has been vanquished by UV stabilising the polyethylene, now armoured to adhere the pressures & withstand rupturing. Overhead the doors lies an air-vent, duplicated at the opposite side they generate a perpetual slipstream of freshness to the interior to forestall moisture condensing, particularly prevalent in humid conditions, helping to control a healthy atmosphere for storage. 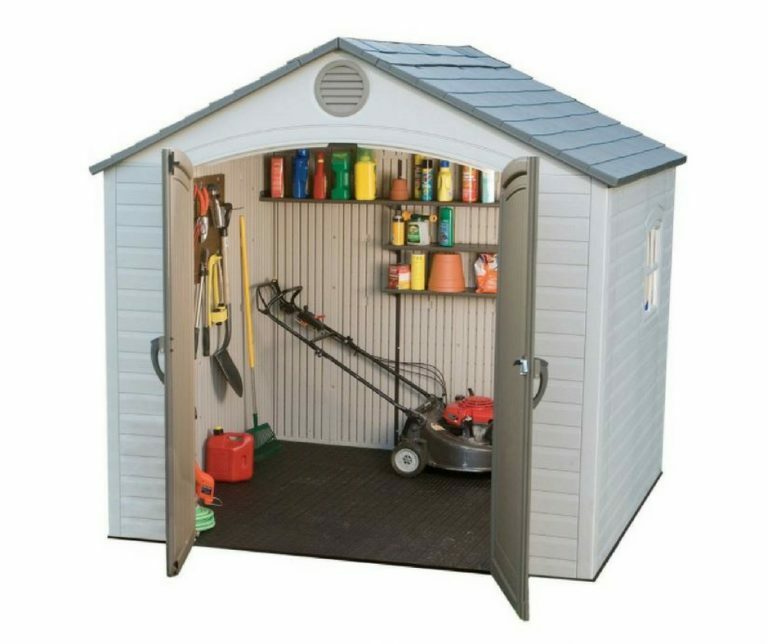 It’s a seldom occurrence to find a metal shed comprising an integrated floor, leaving the duty of creating a barrier of sealant around the perimeter edge which is a lot easier said than done. Alternatively, incorporating a wooden base is an option however this method is susceptible to damp-decay. Uniting a floor Lifetime’s way delivers a true wall-to-floor enclosure, blocking outside’s leaves and rain from entering, plus it’s resin therefore no rot. These 8 ft wide storage facilities showcase a pristine desert-sand tinge – Not to your liking, consider the competition. Soaking up remarkable feedback regards this 5 ft deep facility, small-to-mid proportions provide scope to accommodate limited backyard zones. Every shed within this range incorporates an apex configuration, a high inclined decent delivers systematic rainwater drainage thwarting the development of puddles & leakage inside aided by the extension of the roof’s overrun beyond the facade. Headroom inside’s 70-94 inches reciprocated by the steep apex incline. Accompanying each 2½ ft roof extension, a powder-coated steel A-frame truss beam is introduced stretching across the internal width buttressing support for winter’s snow. The roof’s structural composition is related to the walls in design, constituting a robust twin sheet formation albeit a greyish tint displays to complement the slated appearance derived through stylish molding techniques, capping off a classic effect. Entry of daylight is enhanced the further up the scale you go, for instance the small 5 ft model embeds two skylights & comprises one window, both manufactured with shatterproof polycarbonate whereas the 15 footer incorporates two windows & five skylights. Some of the newer models have now replaced the roof-lights with an impact resistant transparent strip. Where Lifetime do pressurise the competition regards their inclusive shelving consisting of various straight and corner designs in addition to favoured peg-boards with hooks for dangling garden tools against the walls. 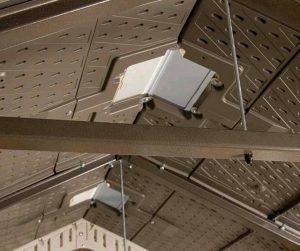 All these accessories securely fasten to the walls nevertheless most install the self-assembly tiered variety to accommodate bulky storage en route towards the ceiling. 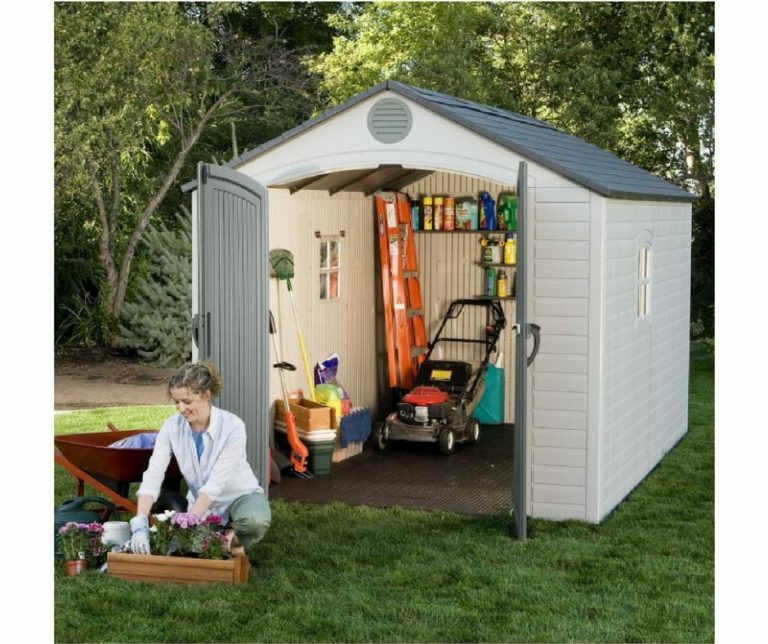 Extending 7.5 feet deep delivers medium capacity for accommodating plenty of outdoor stuff, many satisfy their needs by turning these proportions into a home-yard workshop however admirable feedback flows through reviews regardless of service. Muscular floors encase the base area of Lifetime’s, no worries about their strength to endure tractor stresses, they’re purposely engineered to manage however their key significance to survive long-term is subject to being laid on a flat sold substructure to avert divots appearing through crevices below and to enhance stoutness, undergirded by firm anchorage. Comparable to the facade, a quick wipe regards the facile cleaning duty of the floor, designed to withstands solvent stains in addition to a grip-able surface manufacture that averts skidding. Double doors shaped with high arches across their summit deliver oceans of passage entry accomplishing adequate highness for an adult to walk in without receiving a crack on the nut. Full length hinge-pins function the doors swing, two padlock claps adjoin together on the doors closure for locking up meanwhile two large sturdy handles facilitate entering. Sliding latches fitted to the internal side of the left door slot into grooves above the architrave & down into the floor to ensure a closed position is maintained, a useful addition for gusty weather. Both doors flaunt a putty-brown display, detailed with a wood-patterned surround presenting two-toned charm against the horizontal panelled facade whilst their double skin of polyethylene facilitates the easiest of cleaning duties without succumbing to decay disintegration. Expanding 10 feet provides a sizeable storehouse dwelling for oodles of gear, the reason it’s one of the most popular purchased. Feedback comes across very good, a few have had construction headaches but on the whole it’s highly admired. Construction importance relates to comprehending Lifetime’s recommendations to laying a levelled bedrock of solidity underneath for anchorage benefits, furthermore to deliver a perpendicular structure ensuring the doors maneuver is swing-perfect and the shed refrains from standing skewiff. Like every shed on the market, they will soak in water if submerged. To resolve this issue, prepare the foundations above a floodplain. 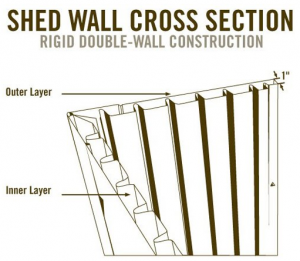 Construction becomes streamlined adhering to these levelled stipulations as the panels square alignment expedites assembly. The same installation procedure materialises no matter what model is chosen nonetheless the larger the magnitude, the more daunting the challenge can become for a novice due to the sheer size. A cement base is usually the preferred foundations for the largest 15 ft version. Constructing relates to a step by step format requiring assemblers to follow & implement the order illustrated in the instructions. This assembly tutorial below provides a good gist of how straightforward the procedure is, demonstrating the interlocking method, alignment & securing the facade sheets, roof & doors. Some great tips here! Substantial build, extensive storage space with ample headroom space conveys throughout feedback relating to this 12 ½ feet storehouse although alerts are expressed to make sure assembly transpires from levelled ground. The larger they are, the more significant this becomes. Lengthwise, 15 feet stretches the max regarding this assortment. Up-above, sideways & a stroll down to the end it’s ultra-capacious, delivering over generous storeroom expanse. 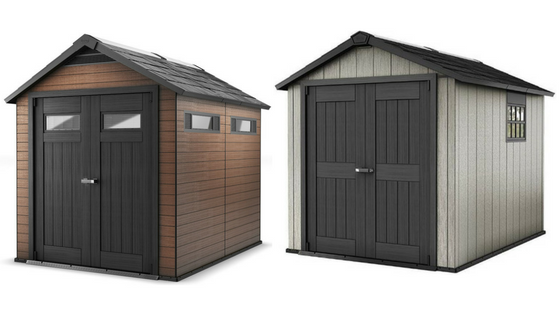 Lifetime maintain their distinguished position in the resin shed world, dominant in the USA. On the whole, global purchasers come across contented regarding the quality of the facade’s chunky polyethylene composition and the structural sturdiness upon completion of assembly. Lifetime express rather a highly confident approach regarding their makeup surpasses their competitors, personally I find this quite a bold statement to make, there’s a few worthy designers knocking on the door exhibiting knockout styles at present. Whether anyone delivers a better construction is purely down to one’s own judgement but they do fulfil a good solid design. Check out Lifetime’s alternatives with twin doors centrally positioned across their length. Accommodating the same 8 ft width with a choice of either 10 or 15 feet lengths along with the preference of single or dual entry access. 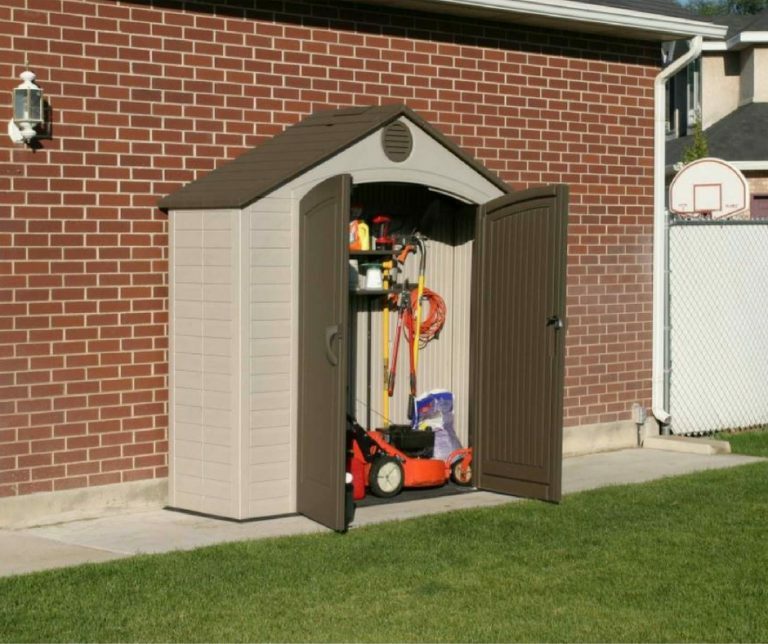 Many thanks for inspecting Lifetime’s backyard storage range. 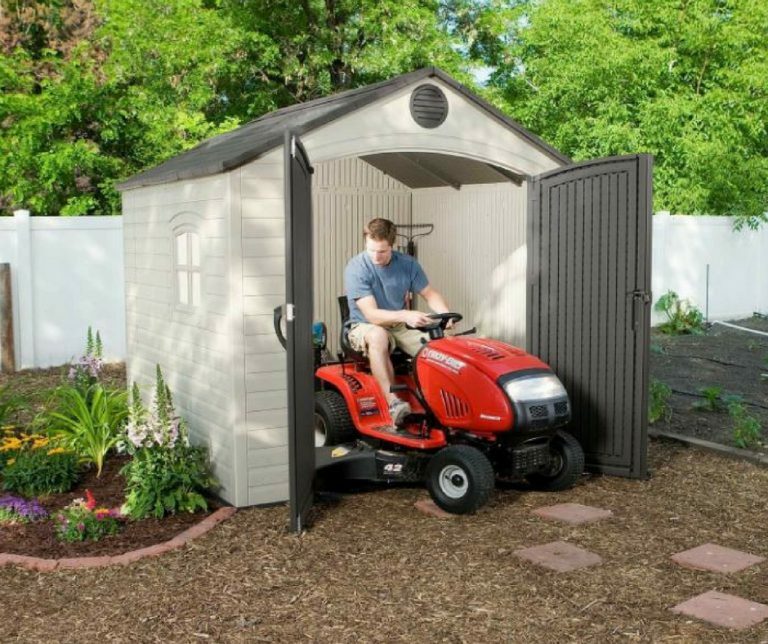 Share your favourite shed design below. Please share these backyarders. Thank you! This post is incredible helpful. We are always acquiring more and more stuff to put into storage and we always seem to be running out of space. 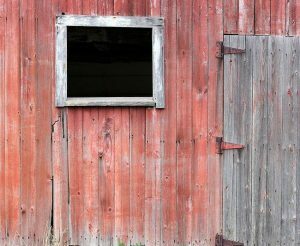 We have build two sheds of our own that already seem to be looking run down with wood rot and peeling paint. 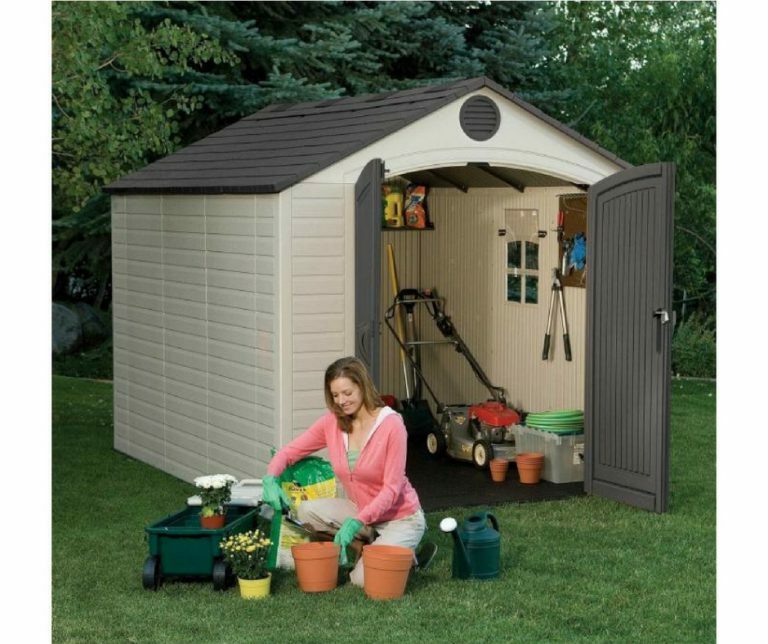 I’ve never even considered these plastic sheds until now. They seem cost effective and look like they will blend in well with our house! Thanks again! 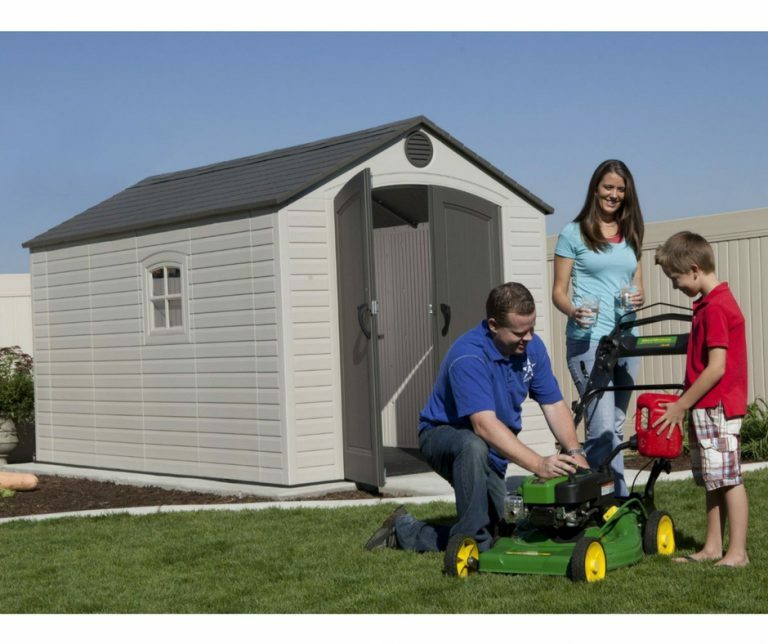 Thanks for inspecting Lifetime’s backyard resin storage sheds. You are right, storage room indoors it at such a premium nowadays, especially considering the new build homes over in the UK to which many people struggle with as home-designers don’t seem to take accommodation room into consideration leaving the construction of a garden shed such a valuable asset. Wee too started of with a traditional wood one, then became disillusioned with the amount of time conservation duties were taking, spurring us to look around for an alternative solution to cut-out re-roofing, re-varnishing and servicing rotting wood, hence a resin manufacture that only requires a wash once in a blue moon. We have found ours extremely cost effective, although it was purchased before some of the new styles of manufactures & features hit the market. There’s plenty of very stylish presentations being developed nowadays to brighten up any home-yard surroundings, including these Lifetime models. Feature-wise and make-up just depends on what one is willing to spend to accomplish desirable looks and serviceability however the top of the range resin prices pretty much relate to those of the standard wooden variety.